Luca is a geographer holding two bachelor’s degrees (ecology: 2000; demography and social sciences: 2004), a master's degree in economic statistics, a specialization degree in Geography and Environment, and a PhD in Economic Geography. He is Associate Professor of Cartography and GIS, Multivariate Statistics, and Strategic Environmental Assessment at Third University of Rome and collaborates with University of Rome 'La Sapienza' on projects pertaining to the field of urban and rural geography. After working with various national and European research institutions on projects concerning desertification, sustainable agriculture, land-use, climate change, urban sprawl and polycentric development at the regional scale, Luca now holds a chair at the Italian Council for Research and Experimentation in Agriculture (CRA). Vittorio achieved his Bachelor in Science degree in Environmental Engineering at the University of Rome ‘La Sapienza’, specializing in the fields of Urban Planning and Ecological Spatial Planning. Successively, Vittorio obtained his Master in Science degree in Engineering and Policy Analysis at Delft University of Technology, where he focused on subjects of Systems Modeling and Policy Analysis of Multi-Actor Systems, and completed his final thesis on Sustainable and Intelligent Cities. Vittorio has participated to several research projects concerning land-use change, urban sprawl and polycentric development, sustainable and intelligent cities and is author of one book and more than 10 scientific articles in English. He now works in Accenture’s Sustainability and Strategy Team based in Milan. Margot has graduated in Chemical Technology and holds a PhD from TU Delft. She has worked for Shell in Amsterdam, Pernis and The Hague. From 1990 to 1995 she was scientific director of Interduct, the Delft University Clean Technology Institute and successively appointed Professor of Process and Energy Systems and became head of the Technology department (now Infrastructure Systems & Services) at the Faculty of Technology, Policy and Management. In 1998 she was appointed scientific director of the Delft Research Center for the Design and Management of Infrastructures and works is director of the Next Generation Infrastructures Foundation since 2003. Ellen holds a PhD in Technology, Policy and Management and is an assistant professor at Delft University of Technology. Her research and teaching focus on decision making for complex problems that require multiple actors to collaborate. She started her career in sustainable urban planning, which is still one of her favourite research domains. She is editor of Bestuurskunde (the Dutch journal of public administration) and regional associate editor of the journal Smart and Sustainable Built Environment. Ivo is a Senior Expert within Accenture’s Management Consulting Experts Group and an associate professor and researcher at the faculty of Technology, Policy and Management at the Delft University of Technology. He is a co-founder of SAGANET (the Netherlands Simulation and Gaming Association), member of ISAGA (International Simulation and Gaming Association) and SOL (Society for Organizational Learning), and sits on the editorial board of the Simulation and Gaming Journal. In parallel with his activities in Accenture, Ivo teaches a master’s course in simulation and gaming design at TU Delft and publishes regularly in the field of simulation and gaming. Mark is Assistant Professor at Delft University of Technology, Faculty Technology Policy and Management, Section Information and Communication Technology. He received his PhD degree in 2009 for the thesis titled `Governing mobile service innovation in co-evolving value networks'. Since 2009, he published 16 journal articles in information systems, telecommunications and business journals. His current research interests focus on smart living and eHealth platforms. Towards Intelligently - Sustainable Cities? In the quest for achieving sustainable cities, Intelligent and Knowledge City Programmes (ICPs and KCPs) represent cost-efficient strategies for improving the overall performance of urban systems. However, even though nobody argues on the desirability of making cities “smarter”, the fundamental questions of how and to what extent can ICPs and KCPs contribute to the achievement of urban sustainability lack a precise answer. In the attempt of providing a structured answer to these interrogatives, this paper presents a methodology developed for investigating the modalities through which ICPs and KCPs contribute to the achievement or urban sustainability. Results suggest that ICPs and KCPs efficacy lies in supporting cities achieve a sustainable urban metabolism through optimization, innovation and behavior changes. 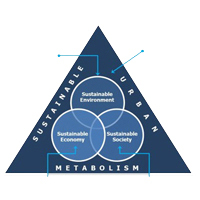 Sustainable urban metabolism, Smart city, Assessment criteria, Regional Planning. Alusi, A., Eccles, R. G., Edmondson, A. C., & Zuzul, T. (2011). “Sustainable Cities: Oxymoron or the Shape of the Future?” (Working Paper 11-062), Harvard Business School – Boston. Angel, S., Parent, J., Civco, D.L., Blei, A., Potere, D. (2011). “The dimensions of global urban expansion: Estimates and projections for all countries, 2000 – 2050”, Progress in Planning, 75: 53-107. Becker, J. (2004). “Making Sustainable Development Evaluations Work”, Sustainable Development, Vol. 12: 200-211. Berke, P. R. (2002). “Does Sustainable Development Offer a New Direction for Planning? Challenges for the Twenty-First Century”, Journal of Planning Literature, Vol. 17: 21-36. Bossel, H. (1999). Indicators for Sustainable Development: Theory, Method, Applications. A Report for the Balaton Group. Winninpeg, International Institute for Sustainable Development - Manitoba (Canada). Brugmann, J. (1997). “Is There a Method in Our Measurement? The Use of Indicators in Local Sustainable Development Planning”, Local Environment, Vol. 2, n. 1, 59-72. Cohen, B. (2006). “Urbanization in Developing Countries: Current Trends, Future Projections, and Key Challenges for Sustainability”, Technology and Society, Vol. 28: 63-80.
Cooper, R., Evans, G., & Boyko, C. (2009). Designing Sustainable Cities, Wiley-Blackwell Publishing Ltd - Oxford. Craglia, M., Leontidou, L., Nuvolati, G., Schweikart, J. (2004). “Towards the development of quality of life indicators in the 'digital' city”, Environment and Planning B: Planning and Design, Vol. 31, n. 1: 51-64. Dixon, J., & Fallon, L. A. (1989). The concept of sustainability: origins, extensions and usefulness for policy, World Bank, Environment Division Working Paper No. 1 - Washington. Deakin, M., & Al Waer, H. (2011). “From Intelligent to Smart Cities”, Intelligent Buildings International, Vol. 3, n. 3: 140-152. Dvir, R., & Pasher, E. (2004). “Innovation Engines for Knowledge Cities: An innovation Ecology Perspective”, Journal of Knowledge and Management, Vol. 8, n. 5: 16-27. Ergazakis, K., Metaxiotis, K., & Psarras, J. (2004). “Towards Knowledge Cities: Conceptual Analysis and Success Stories”, Journal of Knowledge Management, Vol. 8, n. 5: 5-15. European Commission – Research & Innovation, (2012). Smart Cities and Communities. [Online]. Available from: http://ec.europa.eu/research/participants/portal/page/cooperation?callIdentifier=FP7-SMARTCITIES-2013. [Accessed 20th June 2012]. European Sustainable Cities and Towns Campaign. (1994). Charter of European Cities and Towns: Towards Sustainability, European Commission - Brussels. Fricker, A. (1998). “Measuring up to sustainability”, Futures, Vol. 30, n. 4: 367–375. Gaspartos, A., El-Haram, M. & Horner, M. (2009). “The argument against a reductionist approach for measuring sustainable development performance and the need for a methodological pluralism”, Accounting Forum, Vol. 33, n. 3: 245-256. Guy, S., & Marvin, S. (1999). “Understanding Sustainable Cities: Competing Urban Futures”, European Urban and Regional Studies, Vol. 6: 268-275. Hajer, M A. (1996). The Politics of Environmental Discourse: Ecological Modernization and the Policy Process, Oxford University Press - New York. Harrison, C., Eckman, B., Hamilton, R., Hartswick, P., Kalagnanam, J., Paraszczak, J., et al. (2010). “Foundations for Smarter Cities”, IBM Journal of Research and Development, Vol. 54, n. 4: 1-16. Haughton, G. (1997). “Developing Sustainable Urban Development Models”, Cities, Vol. 14, n. 4: 189-195. Hopwood, B., Mellor, M., & O'Brien, G. (2005). “Sustainable Development: Mapping Different Approaches”, Sustainable Development, Vol. 13: 38-52. Jabareen, Y. R. (2006). “Sustainable Urban Forms: Their Typologies, Models, and Concepts”, Journal of Planning Education and Research, Vol. 26: 38-52. Kominos, N. (2006). Intelligent Cities: Innovation, Knowledge Systems and Digital Spaces, Spon Press - London. Lélé, S. M. (1991). “Sustainable Development: A Critical Review”, World Development, Vol. 19, n. 6: 607-621. Levett, R. (1998). “Sustainability Indicators: Integrating Quality of Life and Environmental Protection”, Journal of Royal Statistical Society, A161: 291-302. Li, F., Liu, X., Hu, D., Wang, R., Yang, W., Li, D., et al. (2009). “Measurement Indicators and an Evaluation Approach for Assessing Urban Sustainable Development: A Case Study for China's Jining City”, Landscape and Urban Planning, Vol. 90: 134-142. Mega, V. (1996). “Our City, Our Future: Towards Sustainable Development in European Cities”, Environment and Urbanization, Vol. 8, n. 1: 133-154. Moles. R, Foley, W., Morrissey, J., & O'Regan, B. (2008). “Practical appraisal of sustainable development—Methodologies for Sustainability Measurement at Settlement Level”, Environmental Impact Assessment Review, Vol. 28, 144-165. Næs, P. (2001). “Urban Planning and Sustainable Development”, European Planning Studies, Vol. 9, n. 4: 503-524. Parris, T. M., & Kates, R. W. (2003). “Characterizing and Measuring Sustainable Development”, Annual Review of Environment and Resources, Vol. 28: 559–586. Reed, M., Fraser, E. D. G., Morse, S. & Dougill, A. J. (2005). “Integrating Methods for Developing Sustainability Indicators to Facilitate Learning and Action”, Ecology and Society, Vol. 10, n.1: r3. Robinson, J. (2004). “Squaring the circle? Some thoughts on the idea of sustainable development”, Ecological Economics, Vol. 48: 369-384. Santinha, G., & Castro, E. A. (2010). “Creating More Intelligent Cities: The Role of ICT in Promoting Territorial Governance”, Journal of Urban Technology, Vol. 17, n. 2: 77-98. Satterthwaite, D. (1997). “Sustainable Cities or Cities that Contribute to Sustainable Development?”, Urban Studies, Vol. 34: 1667-1691. Stren, R., White, R., & Whitney, J. (1992). Sustainable Cities. Urbanization and the Environment in International Perspective, Westview Press - Oxford. Tanguay, G. A., Rajaonson, J., Lefebvre, J. F., & Lanoie, P. (2010). “Measuring the sustainability of cities: An analysis of the use of local indicators”, Ecological Indicators, Vol. 10: 407-418. Wallbaum, H., Krnak, S., & Teloh, R. (2011). “Prioritizing Sustainability Criteria in Urban Planning Processes: Methodology Application”, Journal of Urban Planning and Development, Vol. 137, n. 1: 20-28.